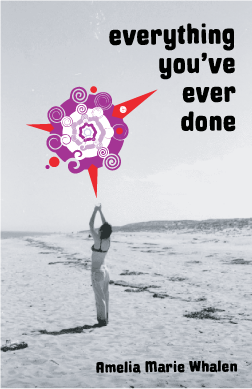 Today we are interviewing Amelia Marie Whalen, author of the memoir Everything You've Ever Done. I am an outdoor adventure girl living in the Southwest. My passion is rock climbing. I work as a technical writer and am a professional playwright. Everything You’ve Ever Done is a memoir of my wild 20-something love affair that turned to tragedy when my husband died from a rare brain disease. It’s not a “young lover dying early” story shot through a soft filter. It’s a pungent, rollicking story of two center-of-every-party types who lived hard and full. Dave and I were real-life characters who blasted through a life stranger than fiction. And we created a story as deep and powerful as any spiritual guide. Your inspiration to write this book was due to something your husband, Dave, said after a diagnosis with a brain disease. Can you tell us a bit about this decision to write the book? Dave inspired me in many ways, through his words and by his example. The last sentence he said to me, before the brain damage robbed him of speech, was “I appreciate everything you’ve ever done for me.” He spoke out of the blue, but with total clarity and sincerity. Dave’s character and those words gave me strength at the time and have motivated me since then. Your book is chock-full of adventure. Did you and Dave always lead such adventurous lives? When Dave and I met in our early twenties, we both had adventurous backgrounds. I’d been camping and hiking since I was a small child and rock climbing from the age of 13. Dave was a world traveler, helping his father run a South American import company since he was a teenager. Together we adventured in the woods, on the road, and with our business and art pursuits. I think that those who feel deeply and strive to experience the richness of life would most appreciate the book. I think anyone struggling, especially with illness and death, can find comfort in my story. Did anything surprise you as you were reflecting on your past and writing this book? Anything that you realized looking back but didn’t realize or appreciate at the time? The importance of Dave and my story’s background surprised me. I didn’t realize before I started writing and building the book’s structure how much of our pasts would be relevant to the way we lived and dealt with Dave’s illness. I didn’t expect to include so much of our lives from before the time when we met and leading up to the onset of Dave’s illness. It took me a while to understand the importance of the big picture and how impactful our pasts were on our character development. My book will reassure people that suffering and death are parts of our human experience that enrich our lives. These aspects of our existence are a reality that doesn’t have to be feared or avoided. Embracing the bad with the good is essential for spiritual development. We are blessed, even by tragedy. Readers will see that the most devastating life circumstances can create personal discovery, peace, and acceptance. You’re currently in the process of finding a publisher or agent, and are sharing some excerpts with readers. Can you tell us a bit about the excerpts you’re currently sharing with readers? I am attempting to give readers pieces from both the dark and light parts of the book. It’s undeniable that parts of the story read as tragedy and are heavy and sad, but I hope that other parts read as a love story and inspire. Anyone who'd like to be notified when the book is released can sign up for the mailing list, at either the Facebook page or the blog.